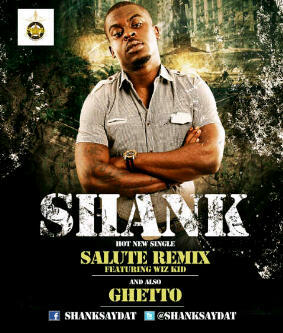 SHANK DEBUTS HIGHLY ANTICIPATED "SALUTE" REMIX WITH WIZKID + BRAND NEW SINGLE "GHETTO"
Best known for his award-winning hit single “Julie”, SHANK is a popular and commercial Nigerian Pop singer, songwriter, producer and recording artist with a unique and eclectic style. Born in London and raised in Lagos, Shank draws his influences and inspiration from his mentor, the late legendary Fela Kuti and his own father who was a musician and part of Fela’s band. Signed to Starville Entertainment in 2008, Shank went on to release the Club banging hit debut single, “Julie” which propelled him to the top of the charts all over Africa and confirmed his position as one of Nigeria’s most talented and most popular artists. Later that year he released his 17-track debut Album, King Kong, which featured songs with Akon and D’Banj. Shank – who has performed on stage with the likes of Mary J. Blidge, Chris Brown and Fat Joe to name a few - is now working on his second album with Starville Entertainment. A more mature artist now, both his style and his message have evolved and the album promises to be amongst the most popular of 2012.